Threads is offering a $50 gift certificate to their online shop. To enter, please check out the Threads shop and leave a comment here sharing which piece of jewelry is your favorite. You can gain an additional entry by liking The Shine Project on Facebook. Please leave a separate comment for each entry. This giveaway will be open until Friday, November 30th. Good luck! So many beautiful pieces and what an amazing project! I love the arrow of hope and the jahlil. I love the shine necklace w/ the star charm. Such gorgeous work! So great!!! I like the Brianna Chain & the arrow of hope. I love the spike studded bracelet! So cool! I love the 'Nykelle' bracelets. I liked them on Facebook as well. I love this shop's beautiful origin! The bow bracelet is my favorite! You can find me at missionamanda at gmail dot com. I really like the Ashley ribbon bracelets. I like the Shine Project on FB! lovin the arrow of hope bracelet! Hmmm. I think my favorite is the Nykelle bracelet. Great shop and great cause! Wow! I've never heard of Threads before but what an amazing mission. What a great thing they're doing for these children. I actually really love the bracelet you have featured at the top of your page (the Nykelle)-- it's very pretty! What an amazing shop! I love how simple and gorgeous their pieces are. I love the bow bracelet and the turquoise bracelet. Thanks so the giveaway! I love the nykelle and jasmine bracelets. So pretty! The arrow of hope and the spike set. Love. Liked the shine project on fb too! Oh this is such a great giveaway and such an awesome project. I love the personalized bangles and the 'arrow of hope' bracelet. I love the double wrapped wood bracelet. But it was really, really hard to choose just one. Such beautiful jewellery for a beautiful cause! I love the Nykelle. And what a cool shop! It took me forever to decide, there are so many good ones! Thanks for showing us such a cool website. I love Nykelle. So Pretty! i liked the shine project on facebook! Franchicas bow in black really stands out to me, as well as the Neon Neon, but The story behind the Alex Bracelet makes It my favourite by far! This is such a lovely cause! I love the arrow of hope bracelet! I love the studded bangles and arrow of hope bracelet! I Love Nykelle ! so beautiful. The arrow of hope is also so beautiful! beautiful jewelry, beautiful cause. I lovelove the Arrow of Hope bracelet! This concept is so beautiful. I love the nykelle. so beautiful! I'd love the Nykelle bracelet and the bow bracelet! They are so beautiful and would fit so well with my wardrobe. The Alex bracelet is really cute! I love the arrow of hope bracelet. But the Bow bracelet has to be my favorite! The turquoise square bracelet is beautiful! I love the Jahil bracelet! So cute and awesome project! Love the arrow of hope and nykelle bracelets!! I like the Nykelle bracelets! The Nykelle and Briann are my favourites. Thanks for the giveaway! I adore the arrows of hope bracelet!!! It is amazingly cute along with all of the other magical bracelets as well. I love the Brianna bracelet!! I love the Arrow of Hope bracelet, that would be so inspiring to wear every day! I love the Nykelle bracelets! I think the Nykelle bracelets are my fav for sure! The Bow Bracelet is my favorite! I love the bow trend right now! I like the Alex bracelet. I love the arrow of hope. What a beautiful project...I hope someday if I have success with my online store that I can donate some profits as well. I like the Arrow of Hope bracelet! I also like threads on fb! I love the Double Wrapped Wood Bracelet in every color they offer! Love the Arrow of Hope! My favorite is the Arrow of Hope bracelet. Thanks! I love the alex bracelet! I really like the inspire gift set! Also I liked them on facebook! Nykelle is awesome! I love it! Also, I like/follow TSP on FB! The Nykelle bracelets are beautiful! I love the Alex bracelet! It's beautiful. Also, I liked Shine project on facebook. i love the concept of this shop, so beautiful. i love the personalized bangles. <3 if i win i will get one of those and put my baby on the ways name. so amazing. 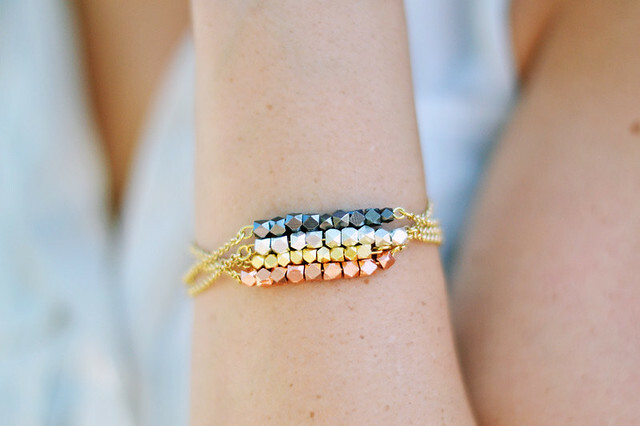 I adore the Alex bracelet, such unusual colors but such a simple design! I love the Vanessa bracelets! I really love the arrow of hope bracelet! I liked the shine project on fb! What a great cause! I like the Infinity Friendship Bracelet... beautiful things! The Nykelle is definitely my favorite, hands down. The Arrow of Hope bracelet is definitely my favorite, I love supporting entrepreneurs with dreams - I'm one too! I COMPLETELY love the Nykelle beads. So shiny! So, so pretty! I can't tell you how much I love the Arrow of Hope bracelet. The Brianna Chain is soo cute!! I liked them on Facebook also. Great giveaway!! So hard to choose! I love the bow bracelet, and the Turquoise Square bracelet for sure. Love the arrow of hope bracelet! So pretty! I love love Arrow of Hope bracelet!!! It's so cute!! I love the Mary bracelet and the personalized bangles. what an amazing shop with an amazing story! The Nykelle chains are my favorite! I love the Alex bracelet the most! Hands down the Arrow of Hope bracelet. Love it. I absolutely love the Arrow of Hope bracelet! I really like the Arrow of Hope bracelet! i really love the arrow of hope! My favorite item is the Inspire Gift Set! I like the Ashley Ribbon Bracelet set. I also love the mission of this organization. I think it's wonderful that they are instilling confidence in these students and showing them that through hard work you can achieve your dreams. The Bow Bracelet is amazing!!! I love the pictures of multiple strands. I admit my eye was first drawn to the Nykelle. I use a wheelchair & am always looking for a way to be in style & still not risk getting caught in the wheels! Lots of choices here! I love the all star bracelet! Favorite has to be the Arrow of Hope bracelet! Also liked The Shine Project on Facebook. Franchica's Bow Gold bracelet is my absolute favorite! favorite has to be arrow of hope bracelet!! Love the turquoise square bracelet and the nykelle bracelets too! Thanks for a lovely giveaway. I liked The Shine Project on Facebook. There so lovely! I love the delicate ones. Also, liked the Shine Project on FB. Thank you Threads, thank you Katie!!! !